3D1616 printer, features in advanced printing control program and its fairly fine printing details. High quality printing with one button, it makes your designs become real models. 3D printing, never so easy! - High quality compact metal frame gives the printer stability and good finish; And colorful acrylic planes brings a fashionable touch to the printer; with the in-built LED light shining from inside, 3D 1616 printer combines perfectly the technology and fashion. - With that 4.4 inch OLED operation interface, printing can be done easily without PC backed up by the necessary information displayed on the screen. - "One-button printing" function, integrating “open software, connect computer, select file, set parameter, start printing” workflow into one button. Users just need one long press to print directly, it makes printing much more efficient. 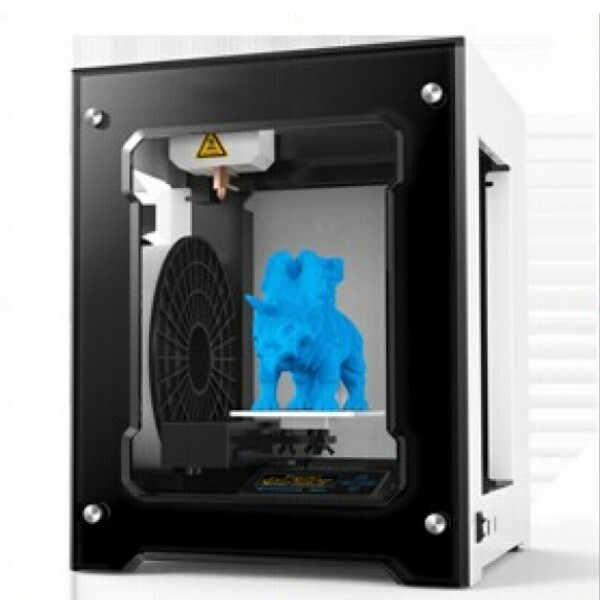 - Brand new print software 3Dstart is more user-friendly; users can get a high quality printed object very easily, even if a first learner can soon become a“magician”of 3d printing. - Meanwhile, print parameters are available for modification, which allows “experts” to adjust the core parameters to customize the printing. - Multi-color printing: creative colorful printing function (pause to change material), when there is a need for material change or a shortage of material, just click “pause” to change the filament and continue printing. This function not only solves the material shortage issue during the printing process, but also brings colors to the overall printing. - After printing is done, 3D1616 will remind users with a breathing light. - In-built material plate makes the printer more compact and portable. - You can print your own simple tools, no need to run unnecessary errands.